Earlier this week, I visited Charles Tubesing, Plant Collections Curator of Holden Arboretum along with Joe Cochran, Director of Secrest Arboretum. Much more on that later, but for now I simply must push out a Shrub of Any Week shout-out for a native sumac: shining or winged sumac, Rhus copallinum (this specific epithet, instead of copallina seems to be preferred). We saw it at Holden just after a welcome shower. It was in its full glory as reflected in another of its common names, flameleaf sumac. It was in a naturalized area of a mass of underground runners and about 6-8 feet tall, though plantings can reach twice that height. As the pictures show the combination of lustrous fall oranges, reds, greens, and purples is spectacular. It is loved by wildlife, does well along highways and in landscape plantings such as at New York City’s High Line Park, has creamy yellow-white flower clusters earlier and now clusters of resinous drupe fruits. For some reason I have not noticed the gummy exudates associated with the fruits of this sumac, but “copallinum” means resinous, so I suspect this is the reason for the nom de plume. Flowers of 'Creels Quintet'. Photo from Joe Cochran. ‘Creels Quintet’ is a cultivar with five leaflets to the compound leaves instead of the usual 9 or more leaflets. The wings on the stems are cool. 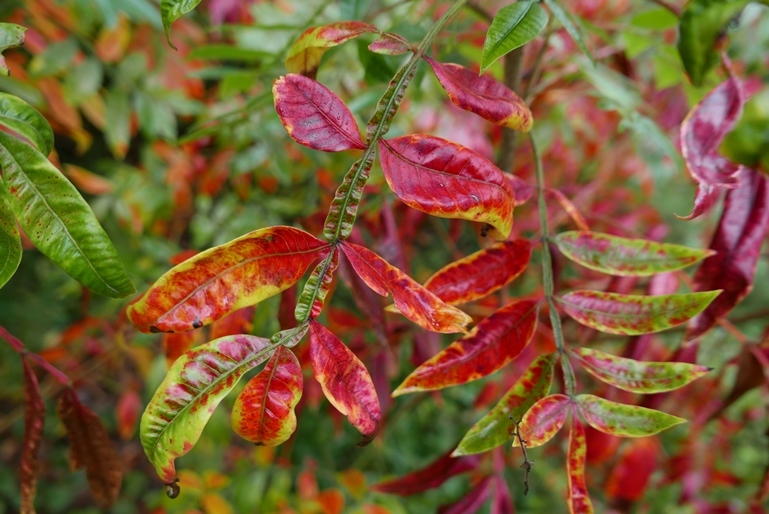 Winged sumac is a great rural and urban survivor.